Okay,Right now I am not home but at my son’s 16th Bday party in a game/internet “bar” for kids 🙂 and I found this here. I really want to go home and order this…so don’t you go and buy it out from under me okay? 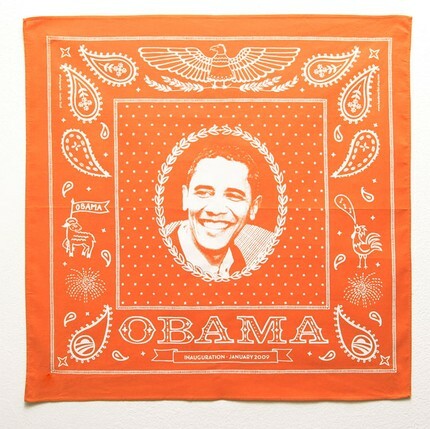 I saw this horrendous (in my most humble opinion) tablecloth, but this bandana I really like! It comes in a groovy green too so if you do buy up all this cool orange then at least save me one of these! The party is wrapping up, and I have to get home to the studio….lots of sewing has been going on, and I am looking forward to sharing with you my latest quilt for Free Spirit as well as a couple giveaways. Oh and an interview with my new online buddy, Jennifer Paganelli! Happy 16th to your son!! Great idea for a Bday party!